Blogging is almost old as the internet itself. Our Founder, Garrett Smith, started his first blog in 2005! Initially, bloggers used “weblogs” as personal diaries where they posted updates about their lives or topics that interested them. Now, due to their personal and relaxed tone, medical professionals along with other brands use blogs as a way to humanize their practice and engage with patients. Blog content can consist of just written articles, or it can also include videos and visuals, such as infographics. A regularly updated blog influences your search engine rankings. When a search engine sees fresh content on a consistent basis, it knows your site is active and not static. A blog is also an easy way to create specific pages for the keywords and search phrases you want to appear for highly in the search results. Blogging is important for healthcare practices because it helps you get found by patients on search engines. 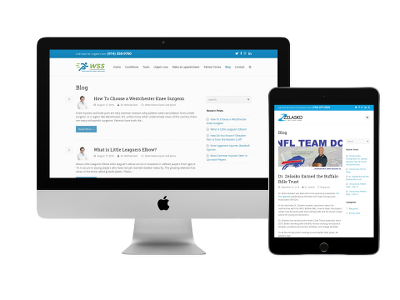 Blogging provides engaging content for your patients and helps sets your brand apart from other healthcare practices. It’s a way for you to keep your patients updated, to educate them on their health and medical needs, and to share important information. It’s also the basis for your social media participation – without lots of content to publish on your profiles, it’s tough to effectively participate. Sounds great, right? Who wouldn’t want to all of this for their practice? So, how exactly does blogging work? WANT TO GET YOUR PRACTICE BLOGGING? The first step to having effective blog for your practice is setting up a content calendar. Surprise, surprise. The best practice bloggers have a plan! A content calendar maps out what posts you will publish over the next several weeks or months. It outlines the topics to be delivered, touchpoints for the post, the keyword focus (if any), due dates and who is assigned. Your content calendar can stretch as far into the future as you want–but keep in mind that trending topics will change rapidly, so it’s best to keep your calendar to a shorter time frame like a month to a few months. Many combined their content calendar with their social media calendar, giving them a unified view of their efforts. Here’s how to go about developing a content calendar for your practice. Before you can map out your content calendar, you need to consider your target audience. Each piece of content should be written for a specific group. 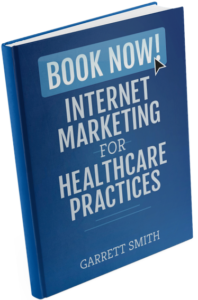 For healthcare providers, that audience will be your patients and potential patients. Put yourself in your patient’s shoes. Take some time to create a persona of your typical patient to help you think through their scenario, and then walk through how they might search for answers to their pain. Understanding how patients are thinking about their conditions and the treatments you provide will allow you to create content that captures their attention. For instance, if you’re writing about carpal tunnel, take some time to understand some of the ways they may try to alleviate the pain without surgery. How does carpal tunnel affect their day-to-day life? How do they try to cope? What search terms would they type in on Google? What would they ask their friends on Facebook. You can also ask them what topics interest them most or use the questions they ask most frequently in the office as initial topics to explore. Another thing to consider as you write for your audience is that most of them won’t understand medical jargon. If possible, avoid words that aren’t readily understood by the general public. If you must use jargon, explain the meaning and link to a dictionary definition. To see how easy to read your content is, consider running it through a Flesch-Kincaid test. The closer your score is to 100, the easier it will be to read. You should aim for a score above 60 to keep your writing on a 8th to 9th grade reading level. Is the topic relevant to your audience’s lives? One reason narrowing down your target audience is so important is because it will help you choose topics they can relate to. For instance, a senior citizen with back pain won’t be interested in articles about how jogging relieves stress while a 30 year old marathoner, however, would be. This is why it’s important to know which patients you truly want to serve. If you serve a variety of patients, be prepared to create content that speaks to them all. Is it directed at your audience? Your blog should cover topics that your audience will be interest in reading. Much of what you post will be about medical topics, but it’s also a good idea to post about local events like a charity cookout or little league games. Lighten up your informational medical content with content that touches your patients’ daily lives. Brainstorming new topics to write about can be exhausting. Tools like Buzzsumo or Google Keyword Planner are helpful in coming up with multiple topics. Buzzsumo, for instance, tracks popular articles online. Type in a general topic, like carpal tunnel, to see other similar articles. Buzzsumo will generate a list (see below) of popular related content. Google Keyword Planner is another good tool to find topics. Type in a keyword like “carpal tunnel treatment. Google Keyword Planner will generate a list of similar keywords. As an example, from the list below, you could write articles on carpal tunnel surgery, different types of treatment, how to get relief from carpal tunnel, or carpal tunnel exercises. Both of these tools can help you brainstorm a list of topics to include on your calendar. Another good place to look for trending topics are social media platforms like Twitter, Facebook, or Reddit. When you start outlining topics on your content calendar, it’s easy to be overzealous and plan more than you can handle. While posting once a day or even three days a week will increase your traffic, writing blog posts is hard work, so it may be better to aim for one or two posts a week. One well-written post is better than five poorly-written posts. Check out your competitors to see how much they post. If they post irregularly or rarely, you’re already a step ahead by publishing content once a week. If they post more often, you will probably want to match what they do. One way to increase your content is to ask your peers to guest post on your blog. This will give them added publicity and credibility as well as take some pressure off of you to create content. Your patients will see right through any lack of authenticity. Because our culture is internet savvy, they are street smart when it comes to scams or frauds. Being true to yourself sets you apart from the crowd. The internet is a crowded space, and you’re competing for their attention with their favorite celebrities, their friends, and every possible brand out there. Putting a human element into your blogging makes you more trustworthy and helps your patients relate to you. They are more likely to engage with you because they sense that you are being honest. That’s all good and well, but how do you come across as authentic to faceless readers? First, listen. It all starts by listening to what your patients have to say in your office and online. What are they struggling with? What do they need to hear? Empathize with them by showing them that not only do you understand where they are coming from, but you know how to help them. Don’t be afraid to be passionate. Share causes you care about, and take a stand. For instance, if you believe a certain treatment does more harm than good, don’t be wishy-washy. Say what you think and explain why. Keep your messaging consistent, both on and off line. Your voice on your blog should be consistent with what patients hear when they visit your office or talk to you on the phone. Educate your patients on issues that are important to them. If you cater to 30-something year old athletes, you could write a post on how to avoid injuries as their bodies age. If you cater to older patients, they might appreciate articles that provide tips on how to avoid common bone or muscle ailments or information on osteoporosis treatment. You can also include informational articles on popular medicines or current events happening in the medical world. Using color images in your posts will increase the likelihood that your audience will actually read your post instead of scrolling past it. Visuals help grab your reader’s attention and engage them in what you are reading. A blog post on arthritis could include images showing the difference between an arthritic knee and a healthy knee. A post on how to protect muscles while lifting weights could include a graph showing percentages of athletes who injure themselves. Once your posts start garnering some traffic, your readers will start commenting on your articles. Some comments will be positive, others will ask for more information, and you can count on some negative ones as well. Responding to comments can be time consuming, but it’s an important part of blogging. Your audience needs to know that this post is just the start of the conversation. Engaging patients in the comments could eventually lead to them coming to your office. Unless you actively promote your blog, few people will ever read it. Work to build relationships with other bloggers in your field to cross promote each other’s posts. Share every article on your social media accounts and use a tool like Mailchimp or ConstantContact to email your posts to your patients every month. Also consider reaching out to colleagues and influencers in your field to ask them to share your post. When you do your topic research, you’ll find other sources who have written similar material. Share your article with them in hopes that they will share with their networks. All your content should be geared to share on social media. Plan to reshare the posts throughout the year, repurposing them if necessary. If you are an active blogger, it’s a matter of when, not if something negative happens. A reader may leave an inflammatory comment or send a hateful email. Be quick to respond to negative comments. Show respect to the commenter. Don’t be afraid to ask to move the conversation to a more private platform if necessary. Acknowledge their point of view and ask questions to find out where they’re coming from. Then, as kindly as possible, don’t feel bad about briefly defending your position. One scenario that could occur is someone comments that a treatment you list for arthritis didn’t work for them. Similar to responding to negative patient reviews, the best thing to do is take the high road and work offline to rectify the situation, if required.